A few weeks ago I nipped into Boots to look for the new essie Cashmere Collection (no sign but I will hopefully have them by next weekend so keep an eye on the blog for these!) but I did find the new Fall Collection. And essie polishes were on buy-one-get-one-half-price, so it wouldn’t have made financial sense to pass up that opportunity. Right? This is a collection I ended up liking a lot more than I thought I would. The colours are 70s inspired, which is very on-trend at the moment. The autumnal vibe is super strong but also has nice shades that will see you through winter as well. First swatch had to be my absolute favourite polish from the collection (and the shade I’ve been wearing all week) ‘with the band’. This is a ‘toasted spice burgundy’ and I’m in love. I am very fond of red nail varnish, but the hint of brown in this makes it really unusual and unlike anything else I own. I think this will be a favourite this autumn. The below pictures had 2 coats and topped with Seche Vite. 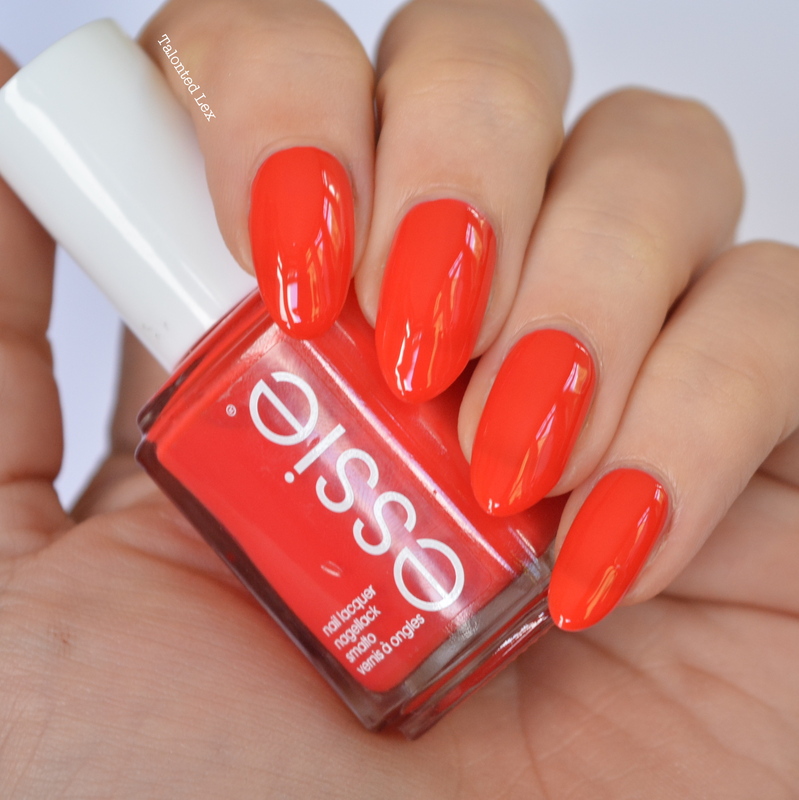 ‘leggy legend’ (arghhh essie’s naming conventions of no capitals really causes me pain in blog posts!) is a ‘glamorous alloyed bronze’ and again, I don’t have anything similar in my collection. This is really easy to apply – some metallics can cling to any ridges or bumps in the nails and accentuate them but this was perfect in two coats. As with most metallics, it didn’t have a super smooth finish so a topping of Seche Vite helped to add the lovely shine. I love that this is a more orangey-bronze than your typical shades on the high street. Along with the tiny pink glitter shimmer, this really makes it a stand out colour. ‘color binge’ is the only colour in the range that I feel I already own from a few different brands. It’s described as an ‘addictive orange red’. 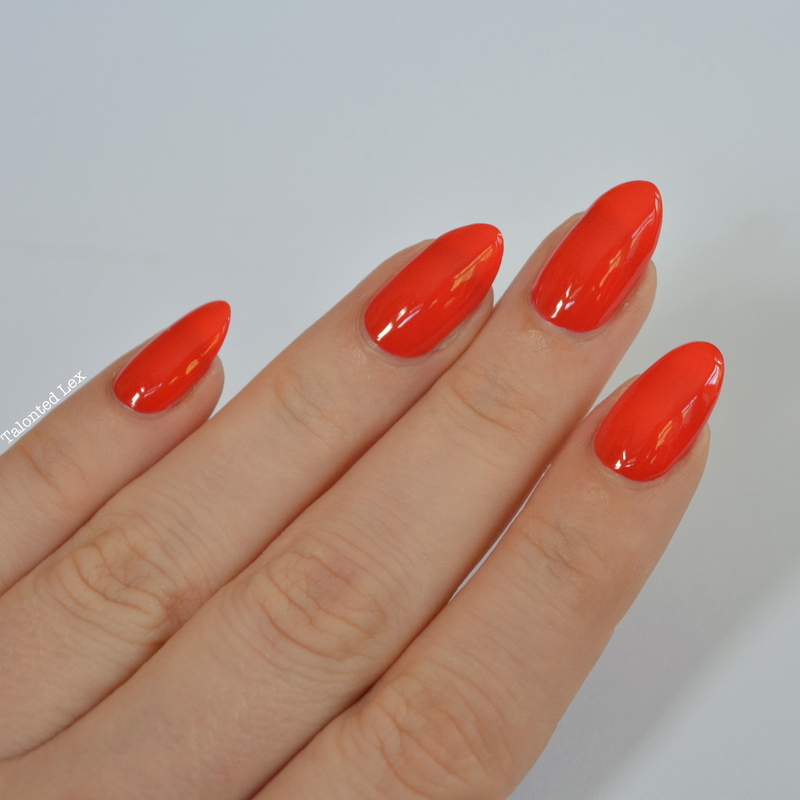 It’s a lovely bright colour (maybe too bright for an autumn collection, in my opinion…) with a great formula. It’s not as opaque as ‘with the band’ and you can still see VNL on the images below which was a shame. When I was looking at the polishes in Boots, I assumed that ‘in the lobby’ would be my stand out favourite from the range. It’s an ‘exotic cinnamon plum’ the looks like a more pink version of essie ‘bahama mama’ which is a wonderful and classic autumn shade. The pink tones don’t come through as much on the nail, it’s more of a dark red/plum but it’s still a very pretty polish. The finish is very jelly-like so it was CRAZILY shiny even before Seche Vite, but it also means bald spots where a 3rd coat was probably needed. With more careful application you could avoid the ‘pooling’ of colour that you can see at the ends of my nails in these pictures, but you may get a VNL with thinner coats. The patches didn’t actually bother me that much, the colour is beautiful and it feels like it would be a great autumn shade that would suit most people. ‘frock n roll’ is a really unusual nail varnish. From looking at the bottle I was quite underwhelmed but once you start applying it, it changes in front of your eyes. The base transforms into a beautiful browny-plum, and the super-fine silver glitter peeks out giving it a galaxy-esque appearance. essie describe it as a ‘shimmering rich espresso’ which I think is perfect! This was 2 coats with Seche Vite. I was pleasantly surprised by this collection and think I will definitely wear all of them over A/W (except ‘color binge’ which I think I will save for S/S16!). Have any of them made their way onto your wish list? Ooh ‘frock n roll’ is gorgeous. I’ve got ‘cosy in cashmere’ and whilst the colour is amazing, it chips so very badly because of the matte finish. Definitely one to whack a top coat on regardless.